Historically, Linux has not had many CAD offerings. Now 3D Slash has stepped in to fill the void, and it even works well on a Raspberry Pi. For a long time, computer-aided design (CAD) was the domain of powerful and expensive workstations. This state of affairs has changed considerably in the last few years. More and more CAD software is becoming available for standard PCs or as a web application. The French firm 3D Slash offers a program by the same name in several versions, including one for Linux. The company promises that the Linux version works without problem on the Rasp Pi. A trimmed down version with basic functionality starts directly from the web browser. In this article, I look closely at the functionality and performance of 3D Slash  running on a Raspberry Pi 2 (RPi 2) outfitted with the current Raspbian "jessie" operating system. I also compare the 3D Slash to Tinkercad , the predominant CAD software offered by Autodesk, Inc.
A user can gather first impressions of 3D Slash (Figure 1) by taking it for a spin on the provider's website. A trial run requires only that the user's system and web browser support WebGL. Figure 1: A trimmed down version of the 3D Slash CAD software is available as a web service. The website and the application are available in English and French. This language choice does not pose much of a problem for non-native speakers, because operations are performed mostly via buttons, with self-explanatory symbols on the start page, the menu option Learn opens a help page that offers various tutorials in the form of short video clips. It is difficult to proceed without first looking at these tutorials. The clips are short but full of information, so you won't be bored. Working effectively with 3D Slash requires that the user understand the basics of how the program works. Classic 3D design software starts with a blank slate and then puts together a result seemingly out of nowhere via small and simple shapes. 3D Slash, on the other hand, starts with a solid block of material like real-world stone cutters. In the program, this block, a cuboid, is shaped into a desired form. Much like a stone cutter, the user accesses various tools, including a hammer, drills, and saws to remove material and a trowel to rebuild parts of the cuboid. Unregistered users can also use 3D Slash as a web application. Registration is required to install the free-standing and higher performing PC version. Registration has been kept simple: The user merely enters an email address and a pseudonym. Once registered and logged in, the user will find software for diverse operating systems under Products | Downloads. 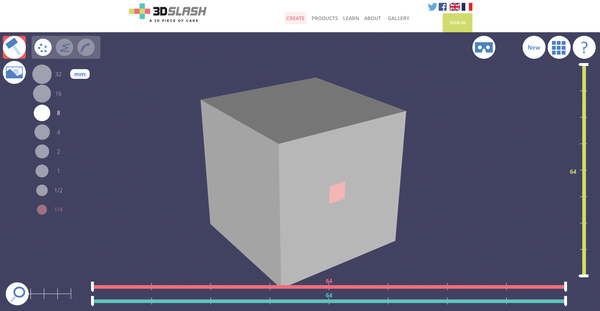 3D Slash v2 was recently released with separate packages for Linux PCs and the Raspberry Pi. Each package comes as a compressed TAR archive. The software can be installed on a maximum of 20 devices and run under a single 3D Slash ID. The rest of this article presupposes that you are running Raspbian "jessie." Based on personal experience, Raspbian runs much smoother on a hard disk rather than on a microSD card. However, 3D Slash writes relatively little data, so it does just fine with flash memory. The application must adapt to a key component of the Rasp Pi configuration: memory allocation. In many projects, it makes sense to minimize the amount of main memory the GPU can monopolize. For 3D Slash, however, the user should assign the maximum amount possible, 256GB, to the graphics chip. You can accomplish this in one of two ways. From the desktop, click Menu | Preferences | Raspberry Pi Configuration, choose the Performance tag, and enter 256 in the GPU Memory field. From the command line, enter sudo raspi-config, choose Advanced Options | Memory Split, enter 256, then Tab to OK and press Enter. You have to reboot to accept the new memory split. When 3D Slash is downloaded via the standard Raspbian web browser, the tarball will land in the /home/pi/Downloads directory. Therefore, the user should use the command line to switch into this directory, decompress the downloaded package to the target /usr/local/ directory, and set the rights necessary for executing the program before starting up 3D Slash (Listing 1). The program creates a ~/3dslash/ folder in the home directory to store its data; otherwise, the program does not change the filesystem. Just more than four years ago the first Raspberry Pi was released to overwhelming response. Many people had to wait for their first-generation Pi while production was ramped up to meet the demand. Now you have an entire array of Pis from which to choose, and demand is still so high that you might have to wait for your computer on backorder immediately after a new model is released. Moreover, the quad-core Raspberry Pi 3 has broadened the possibilities of what you can accomplish with the little nanocomputer. Linux is great, but if you didn't want to experiment with new things, you wouldn't be hacking on a Raspberry Pi. Sometimes new things are old things: The venerable and much-loved RISC OS, which is older than Linux and was specifically designed to run on the ARM chipset, is finding a new audience with the rise of the Pi. The standard Raspberry Pi cases sold in the marketplace do not include space for accessories and add-ons. A DIY case built using a 3D printing service offers a good solution, but some planning is in order. Take your first steps with Python programming and discover the turtle module for creating graphics. The Raspberry Pi is not powerful enough to support fully mature network storage. In situations involving smaller amounts of data, however, the little computer shines as a flexible data hub.